Will Leave You Hooked For Reel! 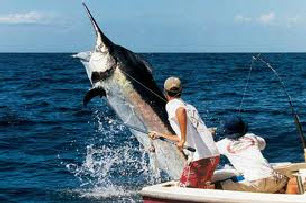 Fishing in the Florida Keys is like a religion to the many people who are in love with this particular sport. At the Florida Keys there is nothing that says "Hello You’ve Arrived In The Fishing Capital Of The World" more than the crystal blue waters that surround our islands. The life that teems in the vibrant waters will overload your senses. The memory of your visit to the Florida Keys will never be forgotten. Anglers fish here with a passion rarely seen anywhere else in the United States.....even the world. Wherever you go you will hear conversations dominated by fishing. Man against The Florida Keys Fish. And you wouldn't be the only one as with over fifty Florida Keys Fishing Tournaments taking place in the Florida Keys each year, you will have more opportunities in the Keys to compete against other like minded anglers than most places on earth. Certainly, pop into any of the bars and pubs throughout the Florida Keys and you will find the talk being of the "Fishy Kind". You can't really escape it, so the best advice is to join in and try to understand the passion that is felt for sport fishing. The Florida Keys have more than 1,000 species of fish and to the delight of the hungry anglers most are edible. 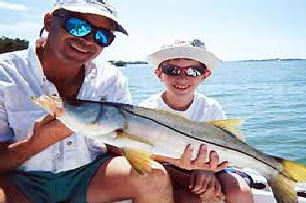 So whether you are into Flyfishing Florida Keys style, Deep Sea Fishing, or just lazing around on a boat whilst someone else catches dinner, your fishy wishes will be realised. But if you can't wait to get your rod out of its case and cast your line into the crystal blue waters,then let's break down just some of the marvelous areas that surround the Florida Keys, and make fishing in the Florida Keys the best on earth. You most certainly will need one unless you are hiring a charter for the day. The continental shelf is nature’s gift to the Florida Keys, and therefore a gift to fishing in the Florida Keys too. It goes for several miles from the shoreline of the islands, until at last dropping into the dark bits of the seas. But before you get to the drop you have what the locals call “The Flats”. An area of water (4,000 square miles) that ranges from a few inches in depth, to several feet, to areas that quite often during low tide show themselves. This is prime fishing territory, as across its expanse is a coverage of dense turtle grass, shell-less sand or just muddy stuff. And who loves to feed and raise their little fishy kids here? Only some of the best fish ready to be caught ever! So where should you be to start fishing at the Flats? They go from Key Biscayne to Key West and beyond, so you aren't exactly going to have to queue up. But one thing for sure if you fancy fishing for Hogfish, or the Gray Ghost itself aka the Bonefish , the giant Tarpon or Permit you would be advised to hire one of our Florida Keys Flats fishing guides. There is absolutely no substitute for a professional guide who know the waters like the back of their hands. It can save you hours, as they have detailed records as to where to fish for the best chance of a catch. All over the waters that form the Florida Keys flats you will see shallow-draft skiffs transporting happy fisherman, or other anglers casting their lines from flats-boats, though many like to adopt the stance of standing in the waters by wading out from the shore. Fishing in the Florida Keys is all about choices. Which makes it of course an anglers dream. Down at the meeting of the mainland Florida and the Gulf of Mexico, a sprightly ecosystem is alive and kicking in a body of water known as Florida Bay. If you look on the map you will see literally hundreds of tiny uninhabited keys, doting the watery landscape, and these little black dots are what we in the Keys call the Backcountry. They are loosely bordered by the Keys, and run from Key Largo to Long Key, and these backcountry waters are home to a myriad of different habits, which make it perfect for fish to flourish. You will find areas of sea grass and mudflats, then mangrove islets and also sandy basins, which lead you to throw your line over board crack open a beer or two and fish for snappers, sheepshead, ladyfish and even the occasional shark. If that hasn’t wetted your angling appetite for some fishing in the Florida Keys then did we tell you that the Silver King, the mighty Tarpon also swims up and down the backcountry creeks, channels and flats too? Psst, we’ll let you into a secret, our mate the Tarpon is rumoured to be particularly fond of the Sandy Key Basin in the summer months. There….saved you hours in once sentence. The Gulf stream, or Florida current as it is sometimes known moves through the Florida Straits south of Key West and and flows northward, along the entire coast of Florida. Although it is slow moving (travelling at about 4 knots) this tropical river stretching about 25 to 40 miles wide maintains warm temperatures throughout. Perfect for a flourishing fishy world. The Bluewater covers deep water from the reef to the edge of the Gulf Stream and is extremely prolific at the humps, which are underwater hills rising from the sea. The Islamorada Hump is 13 miles offshore from the Island of Islamorada. The West Hump lies 23 miles offshore from Marathon and rises from the depth of 1,100 feet to 48 feet below the surface. Bluewater fishing is known universally with offshore fishing in the Florida keys, and for the eager anglers of the world it means one thing and one thing only Game Fishing.